So, which detector should I use for flash column chromatography? In my role as senior technical specialist at Biotage I am often asked about compound detection options. For most flash chromatography methods, UV is the default detection tool since a majority of compounds do absorb some UV light. Diode array UV detectors provide chemists choices in wavelength selection, providing the ability to widen or narrow the wavelength range needed to detect specific compounds and enhance their sensitivity. When diode array detectors fail to detect compounds, it is because the compounds have no chromophore, e.g. carbohydrates, low extinction coefficients, exist in really low concentrations, or any combination of these. In these situations, alternative detectors are quite beneficial. In this post I will discuss a couple of detector options for flash chromatography. When flash chromatography emerged as a purification technique several decades ago, elution methods were primarily isocratic and fraction collection was time- or volume-based (using column volumes). In-line UV detectors (monochromatic, 254 nm) were introduced with the advent of automated flash chromatography which helped to determine which fractions contained a UV-absorbing compound, as many pharmaceutical-like compounds do. Variable wavelength and selectable wavelength UV detectors were introduced later and improved compound detection range and sensitivity. Tunable diode array detectors further expanded the range of detectable compounds and sensitivity enabling fractionation of many previously “invisible” compounds – a major advancement in flash chromatography, Figure 1. Figure 1. 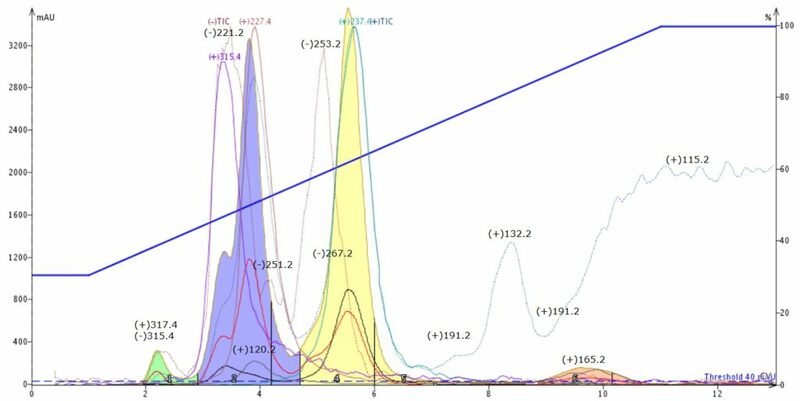 Flash chromatography separation of methyl stearate and cholesterol using UV detection. Top – UV detection at 200 nm (red line), 205 nm (black line), and diode array 200-400 nm (blue fraction). 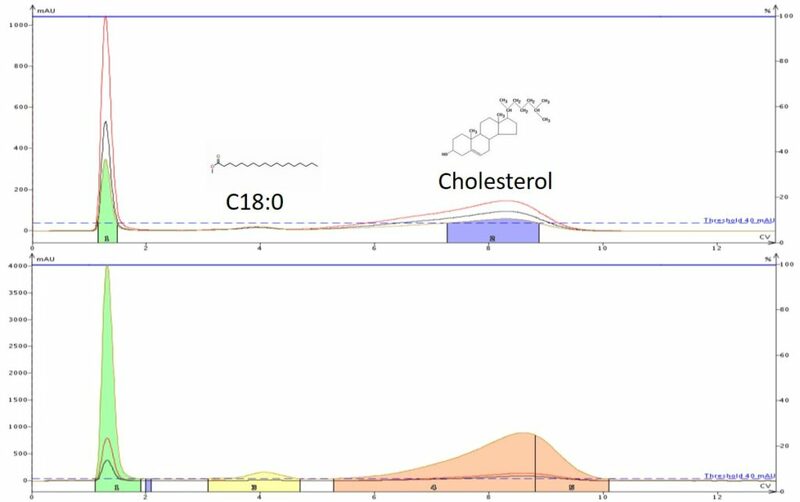 Bottom – same as top but with a more narrow 200-210 nm diode array wavelength range which enhances detection for both cholesterol and methyl stearate. However, there are limitations with UV that require other detection techniques. Currently, two alternative detectors are used for non- and poorly-absorbing compounds and include in-line evaporative light scattering (ELSD) and in-line mass detection (MS). These detectors often “see” compounds otherwise invisible to UV, a real benefit to both organic synthesis and natural product chemists. ELS and mass detectors excel when all sample compounds are UV transparent and when there are a mixture of UV and non-UV absorbing compounds in the crude mixture. The latter is more common than most chemists realize. During some recent training exercises for on-boarding new employees, quinazolinone was synthesized using a Biotage® Initiator+ microwave system, Figure 2. Figure 2. Microwave assisted organic synthesis (MAOS) of 3-benzyl-2-phenyl-2,3-dihydro-4(H)-quinazolinone yields the product plus several by-products. When the reaction finished, TLC with UV detection (254 nm) showed the presence of several compounds, which is not uncommon for organic reactions. 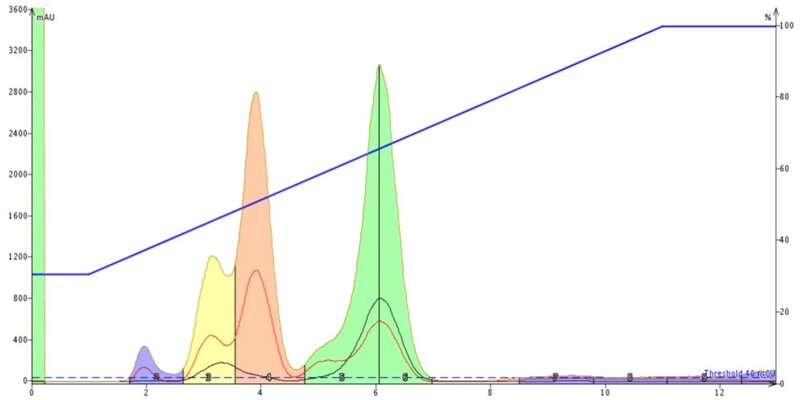 The reaction mixture was then purified using flash chromatography with diode array detection and six UV absorbing compounds were seen, Figure 3. Figure 3. Quinazolinone reaction mixture with UV detection detected six compounds. However, when the mix was re-purified using diode array UV with mass identification, it became apparent that more than five by-products are present, Figure 4. Figure 4. Quinazolinone reaction mixture purification using both diode array UV and mass detection provides both positive mass ID for several of the compounds and shows where other compounds are hidden. A deeper dive into the data reveals the presence of 14 compounds, Figure 5. Figure 5. Quinazolinone reaction mixture with mass analysis identifies 14 different compounds, more than twice the number detected by UV. For more edification, Figure 6 shows three mass spectrum analysis for the same run which identify masses not originally targeted. Figure 6. Quinazolinone reaction mixture with minor masses identified and shown in three different panels for clarity. The red dotted line is the negative ionization total ion current (TIC) and the blue dotted line is the positive ionization TIC. Their responses are very helpful in showing where potential impurities reside. So, it is my opinion that unless your synthesis is known to be really straightforward and clean, relying on UV alone may not provide the purity levels you desire for your target compound. For absolute certainty on the number of by-products in your reaction mixture, I suggest incorporating a mass detector or ELSD with your flash system. Next Next post: How can I make purification of hard-to-separate compounds greener?